Amazon.co.uk currently sells 18,919 books in its Christianity category with the word “prayer” in their title. So that’s the argument made that Christians realise that prayer is important but often unsatisfactory. The answer to this is probably to pray rather than read many, many books, but a couple of good ones can really help, and I think that Paul E. Miller’s A Praying Life is one of those. I found it honest, encouraging and practical, but probably the best of it is the sense it gives of the author’s life and faith, with its serious struggles and increased prayerfulness. 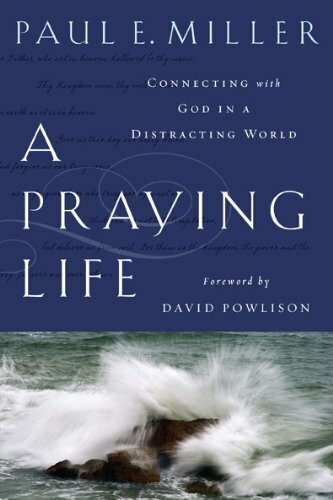 Miller is honest about how hard most of us find praying, and digs into the reasons why: “Prayer exposes how preoccupied we are and uncovers our doubts.” (15) His delivery is more generous than this may sound, as are his proposed solutions which include being honest about how hard we find it in order to discover both God’s graciousness and our weakness, and allowing our minds to wander in prayer as we might in any conversation with a good friend. The book is mostly theory, by which I mean thinking about how we relate to God rather than describing in step-by-step detail how to pray – this comes in the last section. He covers all the issues you would expect, bringing the hope and long-term perspective that usually leave us when we try to pray. Christians can tend towards either easy extreme of triumphalism and defeatism, one of this book’s strengths is how it describes the fullness of a correct perspective through the author’s experience. Nervous pray-ers might find his knowledge of the Bible and how it impacts his praying daunting, but including daily Bible reading in your prayer times will help with this more effectively than you might expect. My main reactions as I read were relief at being reminded of how in charge God wants to be, and excitement that I could get to know God better. A famous piece of advice on prayer is “Pray until you pray.” Reading this book, and not 18,918 others, will help you do this.